I had the pleasure of joining in for an evening Seattle Study Club meeting last week in Woodinville, WA. The evening was a great opportunity to connect and learn. The focus of the evening was treatment planning and a case was presented and then each table was asked to spend twenty minutes evaluating the present condition and treatment planning. The case presented was complex and presented with esthetic concerns, high risk from occlusion, and significant structural concerns as the patient presented with a failing eight unit fixed bridge that was only a year old. The conversations at the tables and when the entire group was brought back together were engaging, and the group easily identified the multiple diagnoses. One of the features of the case that the group focused on was a maxillary occlusal plane that had multiple levels. Some discussion ensued about whether or not the posterior teeth were super-erupted and alternative treatment options to correct this. Another important discussion point was about the existing vertical dimension of occlusion, had some been lost, was it appropriate to open the vertical and how much. It is not uncommon to have a case with an assortment of issues that need to be resolved and feel like we are in a feedback loop without a clear starting point to put the pieces together. In truth all treatment plans have the same starting point and follow a logical series of decision points that adds structure and clarity to the process. I learned this approach from Frank Spear and it has served me well ever since. The treatment plan always begins with placing the incisal edge of the maxillary central incisors in the face esthetically. 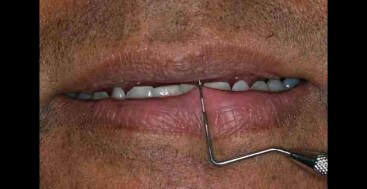 Using a lips at rest photo we assess the existing incisal edge position using esthetic norms. Woman in their twenties show between 3-4mm of tooth display. As we age incisal display decreases, mostly due to soft tissue changes. Women in their sixties will show about .5-1mm. Men typically show less tooth display than woman by about .5mm at a given age. Using this information and both a lips at rest and full smile photos I determine where the incisal edge should be for the patient. This information now let’s me look at the maxillary posterior teeth in comparison to incisal edge and know where the occlusal plan should be. In addition gingival position is determined by achieving esthetically pleasing tooth proportions from the proposed incisal edge position. The lower arch is then planned to achieve the occlusal scheme desired against the esthetically planned upper tooth position.